More evidence of the mobile revolution in Asia has emerged, with the GSM Association releasing a report today that says the adoption of mobile technology has driven economies across Asia-Pacific, boosting gross domestic product growth and creating millions of jobs. The report says that roughly half of the world’s mobile connections are now in Asia Pacific, with some 1.6 billion unique subscribers. GSMA expects Asia-Pacific to reach 1.9 billion unique mobile subscribers in 2017, accounting for almost half of the predicted global total of 3.9 billion. In 2012, mobile network operators generated 1.4 percent of GDP across the Asia-Pacific region, amounting to $298 billion. The full mobile ecosystem contributed $351 billion to the GDP, and mobile technology contributed an additional $650 billion to economic output through improved labor productivity due to mobile working. This makes a combined total of just over $1 trillion. The mobile industry also supported 16 million jobs in Asia-Pacific – with 6.4 million jobs directly attributable to the ecosystem and additional 9.7 million jobs across points of sale and distributors among others. GSMA says that by 2020, mobile could contribue to almost 8 percent of the Asia-Pacific GDP, with the addition of 22 million jobs. 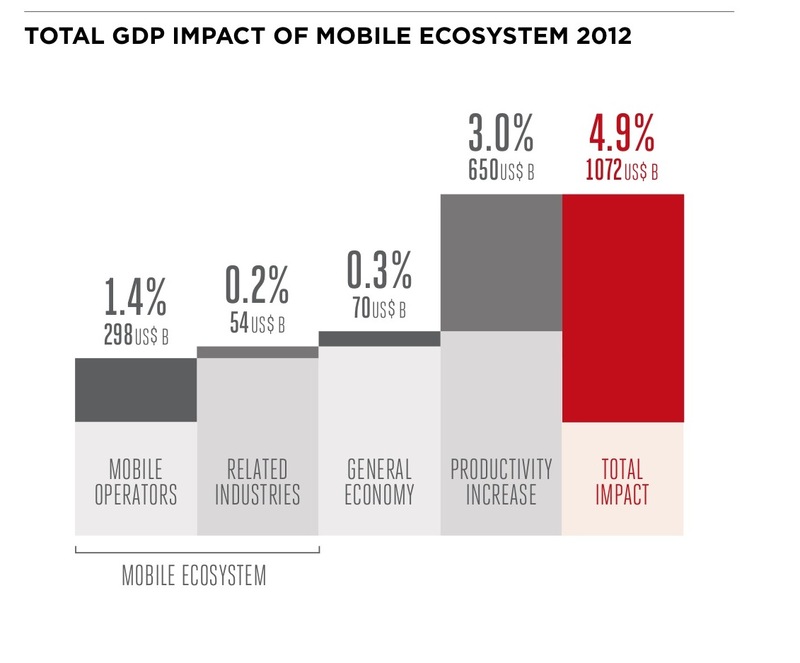 The mobile industry could contribute an additional $2.3 trillion to GDP and a further $200 billion to public funding. Mobile will also serve to improve people’s lives, with 12 percent more people able to access financial services and economic contributions from the mobile industry through $240 billion worth of infrastructure investment and $300 billion of tax payments that contribute to public funding. 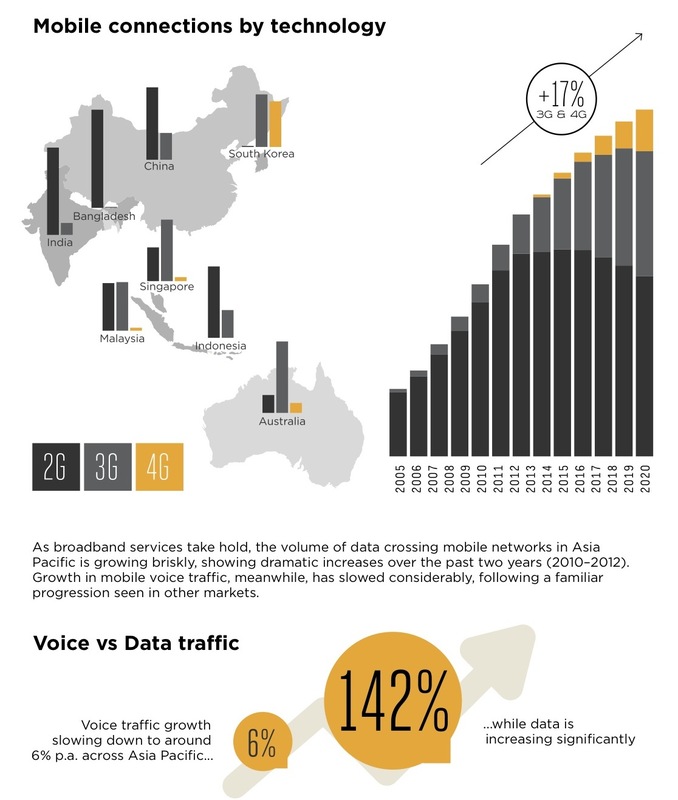 Asia-Pacific mobile subscribers are now predominantly connected via 2G mobile services, but users are migrating to broadband offered by 3G and 4G networks – with GSMA noting that 3G and 4G connections will grow 17 percent every year over the next five years. This has resulted in data usage growing at a compound annual growth rate of nearly 142 percent from 2010 to 2012, while growth in mobile voice traffic has slowed to around 6 percent per annum. The report noted that mobile services are becoming more affordable in the Asia-Pacific region as mobile network operators reduce prices to extend their services to more people – reflected in the steady reduction in price per minute and average revenue per user. However, there are “significant differences” in market penetration across the region, which is a reflection of different market conditions and investment levels in various countries. Changes in regulation are needed to provide the clarity and incentives that attract private investment and spur competition. A stable regulatory roadmap and consistent stakeholder engagement will increase the willingness of telecom companies to invest. It noted that regulators should increase the availability of spectrum for mobile and allocate spectrum lots to operate different technologies, as well as foster the trading and sharing of spectrum, with prices that are in line with international benchmarks. GSMA’s report comes as no surprise, given the rapid uptake of smartphones in Asia. Recently, a GfK report found that the adoption of smartphones is continuing to grow in Southeast Asia at breakneck speed, which found smartphone sales across the region grew 61 percent over the past year. Earlier today, Korean operator SK Telecom unveiled the world’s first LTE-Advanced network, offering speeds of up to 150 Mbps and compatibility for Samsung’s new Galaxy S4 LTE-A smartphone, which also launched today.